How does PX Probiotic work in the body? No PX Probiotic Reviews Found. 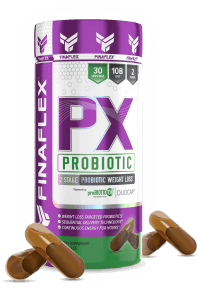 ²proBIOTIC 10B™ is a trademark of FINAFLEX. Directions For PX Probiotic: As a dietary supplement take 1 serving (2 capsules) of PX PROBIOTIC™ daily. To maximize effectiveness take PX PROBIOTIC™ immediately upon waking. Do not consume more than 1 serving daily. Warnings: KEEP OUT OF REACH OF CHILDREN. DO NOT USE IF PREGNANT OR NURSING. Consult your doctor or other medical authority prior to use if you have any medical condition, have a family history of medical conditions, or if you are currently taking any medicines or dietary supplements. Intended for use by healthy adults 18 years or older. Do not exceed suggested dosage. Stop using immediately if you experience adverse symptoms or reactions. Contains 200mg of Caffeine per serving. Do not combine with products that contain caffeine, other stimulants, or alcohol. Do not use for more than 8 weeks. Discontinue 2 weeks prior to surgery. If you are subject to drug testing contact your testing agency before use. Product may cause a harmless tingling sensation. Consumer assumes all liability if product is used inconsistent with label guidelines. Sold by total capsule count not volume. Store in a cool dry place and do not discard desiccant pack after opening. See bottom of bottle for Lot Number and Expiration Date.